PRESIDENT BUSH is obsessed with Middle East policy," said New York Times columnist David Brooks in a recent Public Broadcasting System interview. However, America has major economic and strategic concerns in Northeast and Southeast Asia. Since the defeat of Japan in 1945, America has been the primary foreign power in the region. Its interests have been maintained through security treaties, maintenance of Army, Navy and Air Force bases, foreign direct investment, preferential trade agreements, and cultural and academic exchanges. The goal of U.S. policy in both Northeast and Southeast Asia during the last 60 years has been to stop the spread of communism, which has meant to stop the rise of China. Until China rejoined the world in 1978, U.S. policy was successful. The United States had a strong relationship with both South Korea and Japan in Northeast Asia. Both Japan and the United States were very influential in Southeast Asia. However, as the Chinese economy began to grow at a fast pace, strengthen its military and invigorate its diplomacy, challenges to American supremacy in Northeast and Southeast Asia are more apparent, more successful and more frequent. 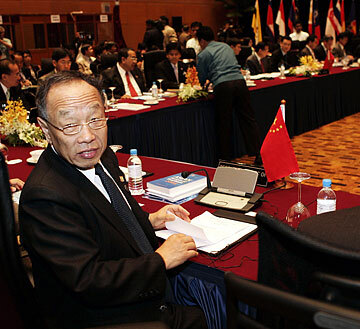 During the 1997-'98 Asian financial crisis, China showed sympathetic understanding toward Thailand, Indonesia and Malaysia by offering financial assistance. Asian nations began to talk about creating a source of large-scale financing independent from the United States-dominated International Monetary Fund. Strains on the South Korean-U.S. relationship have been mounting for years. As South Korean attitudes toward the United States continued to shift, China and South Korea established formal diplomatic relations in 1992. Soon China became an important market for South Korea. Last year the United States redeployed 3,600 troops from Korea to fight in Iraq with no apparent intention to replace them, and plans to continue drawing down troops to 25,000 by 2008. In September 1991, the Filipino national legislature voted not to extend leases on land housing the U.S. military. After the withdrawal of the U.S. Navy from Subic Bay and the U.S. Air Force from Clark Air Base, China began to improve its relations with the Philippines by offering low-cost loans. China's relations with Thailand have soared. Today Thailand is crowded with Chinese tourists. China also built great influence in Cambodia, Laos and Burma. Vietnam seeks a good relationship with the United States, but the Vietnamese Politburo's pre-eminent foreign policy concern is to maintain good relations with China. More recently, China has achieved major diplomatic breakthroughs with both India, the world's second-most populous country, and Indonesia, the world's largest Muslim country, which also is oil rich. IN THE course of improving its relations with its neighbors, a fundamental shift in Chinese diplomatic thinking has appeared. Traditionally, post-1949 China sought diplomatic relations with other countries on the basis of bilateral relations. It has eschewed any form of alliance or multilateral or regional relationship. However, China now appreciates the utility of multilateral relations as it strives to become the leading regional power in Northeast and Southeast Asia, which it feels will ensure its security and continued economic growth. Chinese Foreign Minister Li Zhaoxi attended the ASEAN + China ASEAN Foreign Minister Meeting at the Kuala Lumpur Convention Center Dec. 9 in Kuala Lumpur, Malaysia. As the diplomatic standoff over North Korean nuclear weapons between North Korea and the United States intensified, China offered to host the Six Party Talks, inviting Japan, South Korea, North Korea, Russia and the United States to work out an agreement to guarantee that North Korea would halt the development of nuclear weapons. The SPT have yet to prove any conclusive result other than having embellished China's diplomatic credentials. Shortly after the last formal session of the SPT though, China surprisingly broached a proposal to establish a regional security system in which all powers, including the United States, would participate. Details of the proposal were not made known. However, the establishment of such a regional security system with all parties ostensibly supporting the goal of regional security on an equal basis likely would dilute the influence of the United States in Northeast Asian security. As such, it would create a pretext for further withdrawal of U.S. troops from South Korea and Japan, leaving resident regional security member China in a more influential position. Since the end of the Vietnam War, Asia has experienced the growth of multilateral regional organizations that are concerned with both economic and security issues issues. These include the Association of Southeast Asian Nations, ASEAN + 1, ASEAN + 3, ASEAN + 6, the ASEAN Regional Forum (ARF), and the Asia Pacific Economic Cooperation (APEC). Although not a member of ASEAN, the United States participates in the ARF. It was not invited to the first East Asian Summit on Dec. 14 in Kuala Lumpur, Malaysia. Surprising to many, Russia was invited, albeit as an observer. At the same time, China has become increasingly active in ASEAN, using its newly acquired economic strength, from which many Asian nations have benefited, to promote its leadership. The ASEAN + 1 agreement, signed in 2004, liberalizes trade between ASEAN and China. Signed by national leaders at the conclusion of the summit, the Kuala Lumpur Declaration on the East Asian Summit committed signatories to "fostering strategic dialogue and promoting cooperation in political and security issues." Economically, the KLDEAS promised "development, financial stability, energy security, economic integration." AS A renewed Asian economic giant, Japan is an important player in most Asian multilateral organizations. Thus Japan can use its participation and influence to help promote common interests it holds with the United States. However, it cannot be assumed that Japan and the United States will always be as close as they seem to have gotten. China would certainly like to separate Japan from the United States, since it realizes that Japan's influence in Asia and the world is enhanced by its relationship with America. It is true that given the acerbic state of Sino-Japanese relations that Japan is currently relying more on U.S. security guarantees. The militaries of Japan and the United States have achieved a higher level of equipment interoperability and a more closely integrated command structure. However, as Robyn Lim, professor of International Relations at Nanzan University in Nagoya, Japan, and a former analyst for Australia's Office of National Assessments argues in "The U.S. Puts Japan on Probation," in the November 2005 issue of the Far Eastern Economic Review, a closer U.S. relationship with Japan might lead to the United States getting involved in more disputes between China and Japan. An example might be resolution over the Senkaku Islands (Diao Yu Tai in Chinese). As long as Prime Minister Junichiro Koizumi remains in office, U.S.-Japanese relations should remain stable; however, he is expected to step down in late 2006. While he has been popular with many Japanese, other Japanese and non-Japanese feel that he has unnecessarily exacerbated Japan's relations with China by continually visiting Yasukuni Shrine, where the remains of those who ravaged China during World War II are enshrined. Many Japanese businessmen are eager to improve relations with China. After all, it was the vitality of the Chinese market that was so important in restoring Japanese economic power and is seen as a source of future economic growth. Koizumi's cabinet has been unyielding in its support for Taiwan; a new leader will appoint his own cabinet. Potential future Japanese leaders have indicated a willingness to be more flexible in dealing with China. In some respects, the United States would like to see a better Sino-Japanese relationship; on the other hand, an unwritten principle of U.S. policy toward the two Asian giants is to prevent them from colluding too closely. Combining the economic and organizational efficiency of Japan with the energy and cheap labor of China would be to the strategic and economic disadvantage of the United States. FOR 2005, the United States will experience a trade deficit of nearly $200 billion with China and a $75 billion trade deficit with Japan. When the United States first began to experience large trade deficits with Japan in the 1980s, economists argued that deficits were not as big of a problem as some suggested. After all, imports gave consumers more choice. Important voices such as former Federal Reserve Board Chairman Alan Greenspan have begun to warn that the United States cannot indefinitely sustain such trade deficits, and there is a growing U.S. concern that Asian trade partners do not play by World Trade Organization rules. An editorial in the Jan. 14 issue of the Economist warns about America's trade deficit. To avoid political interference and trade disputes emanating from the United States, and the European Union, and as Asian countries continue to economically grow, they will adopt economic growth policies based on domestic demand, rather than export driven economic growth. In 2006, the gross national product of Asia will grow by 6.7 percent, according to Christopher Hill, U.S. assistant secretary of state for East Asian and Pacific Affairs; a view backed up by United Nations statistics. In other words, access to the U.S. market will be of less importance to Asian nations. While the United States continues to galvanize its attention on Israel, the newly elected Palestinian government, Iraq, Syria and Iran, it also will need to give greater attention to areas in its own backyard such as Bolivia, Venezuela and Brazil, where its traditional diplomatic and economic influence is weakening and China's is growing. At the same time, China will continue to promote both a regional security system and trade block through regional multilateral organizations. With a regional security system in place and economies less dependent on the United States, the U.S. role in Northeast and Southeast Asia will be greatly diminished. REGIONAL reconfiguration will not be easily wrought. There will be periodic economic, political and other policy differences between countries with competing interests. Some nations will distance themselves further from the United States than others; yet no country will completely slam its door on a relationship with the United States, if only to preserve a safety valve in the event of Chinese, Japanese or Sino-Japanese hegemony. China cannot isolate Japan within Asia, and both nations will have to reach some accommodation to promote their own self-interests in Asia. To achieve pre-eminence in Northeast and Southeast Asia, China will take a long-term view, exercise great patience, be flexible, maintain the ability to live with ambiguity and contradiction, plus gingerly and adroitly handle different problems as they surface. About the author: Bill Sharp is adjunct professor of East Asian International Relations at Hawaii Pacific University. He writes a monthly commentary about events in Asia for the Star-Bulletin.